CMWA Honorary President Mary Suresh presents the awards to this year's scholarship recipients. 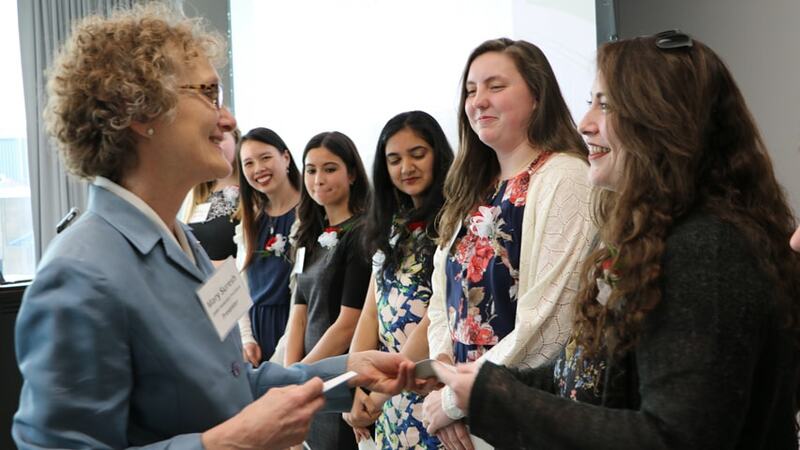 Seven women graduating this month received an early gift from the Carnegie Mellon Women’s Association (CMWA). Each student was presented with a $1,000 scholarship for their commitment to the advancement of women in their academic disciplines. CMWA President Christa Cardone, a 2016 graduate of the Heinz College of Information Systems and Public Policy, said the scholarship winners are a testament to the richness of the CMU experience. “This year’s award recipients represent excellence both in and out of the classroom. From supporting the advancement of women at CMU through programming and activities to interacting with their communities and encouraging leadership and education to young girls, this year’s recipients are a testament to the creative, supportive and curiosity-driven learning experience provided by CMU,” said Cardone, communications manager for the Finance Division. Katherine Borst, a mathematical sciences major, was involved in many activities to support women in science and math. She was a teaching assistant, participated in the Summer Undergraduate Applied Mathematics Institute, and organized professional development workshops and events as Alpha Chi Omega’s vice president for Intellectual Development. She volunteers weekly with CMU TechNights, a program for middle school girls in the Pittsburgh area, and was a tutor at Pittsburgh Science and Technology Academy. Borst hopes to pursue more experience in K-12 classrooms and is planning a career to help shape educational policies for the federal government. Alexandra Cerny, a chemical engineering and biomedical engineering major, is conducting Senior Honors research studying the mechanical effects of structural proteins and nuclear responses to force in cells. The Chemical Engineering Department named her a John Berg Scholar in 2015. As president of CMU’s chapter of the Society of Women Engineers, she coordinated opportunities for women in engineering through various activities during the school year. The SWE also supports outreach initiatives for middle school and high school girls to interest them in STEM careers. Cerny was student director for the Technical Opportunities Conference, which brings more than 300 companies to campus to recruit students for professional positions. Rachel Holladay’s adviser calls her an “academic superstar.” A computer science and robotics major, Holladay has published seven papers in top-tier conferences and journals and has won awards from NASA and the Association for Computing Machinery, among many others. She has been involved in community service and engagement and has made a tremendous impact in the School of Computer Science. She is active in Women@SCS and was a founding member of SCS4ALL. Holladay has served as a leading committee member throughout her undergraduate years, playing key roles in the development and implementation of professional development, and mentoring and networking programs for the SCS community. Following graduation, she plans to pursue a Ph.D. in computer science at MIT and explore robotic manipulation and motion planning. Jacqueline Lee is a graduate student in the Master of Health Care Policy and Management (HCPM) program at the Heinz College. Lee has set a high standard for time management, balancing work with volunteer and extracurricular activities. She is a teaching assistant, a volunteer for a Hospital Elder Life Program at UPMC Shadyside, and co-founder and co-president of the CMU Kidney Disease Screening and Awareness Program. Lee participated in a program with the Pittsburgh Life Sciences Greenhouse to help build sustainable business models and to assist entrepreneurs as an apprentice on projects. She and her fellow students worked with Kids Plus Pediatrics of Pittsburgh on a capstone project to improve patient engagement through enhanced process and technology using the company’s voice over internet protocol system. Alexandra Pasch, an Andrew Carnegie Scholar and a member of Phi Beta Kappa, is majoring in international relations and politics, and ethics, history and public policy. She participated in the Washington Semester Program as a sophomore, and quickly became a leader among her peers as she interned with the U.S. Senate Foreign Relations Committee. In the fall of her junior year she accepted a graduate level internship in Belgium with the U.S. Mission to the European Union. Last summer, she earned an internship at the Center for American Women and Politics in her home state of New Jersey. Her commitment to the advancement of women in politics is a core pillar of her studies and professional pursuits. After graduation, she plans to return to CMU this fall to complete a master's degree in international relations and politics and then attend law school to puruse a career in national security law. Amelia Rosen is an Andrew Carnegie Scholar who is wrapping up her bachelor’s degree in architecture. Rosen has masterfully balanced her academic workload, extracurricular commitments and devotion to the American Institute of Architecture Students. Under her leadership, CMU's AIAS chapter has grown and become more active in the school and region. As chapter president she led the creation of professional development and fundraising tracks, grew membership to more than 100 students and worked to earn official recognition as a CMU student organization. Rosen was instrumental in having Carnegie Mellon selected as the host for “Forge Quad,” the largest national AIAS conference in history in 2016. She recently was named director of the conference’s northeast region. Student Body President Vaasavi Unnava is an economics major and a member of the Dietrich College's Quantitative Social Science Scholars Program. Her campus-wide activities have focused on gender equality, domestic violence and sexual assault, and increasing student awareness and access to mental health resources. Unnava has made it her mission to advance the visibility of women on campus and raise consciousness about their contributions and successes. Her work received national attention during her sophomore year, when she was invited to speak at the “It’s On Us” roundtable discussion at the White House. The invitation was a result of her co-founding and co-chairing the Sexual Assault and Relationship Violence Prevention Committee at CMU. The CMWA has been awarding scholarships to graduating students every year since 1964. The scholarships are funded by CMWA membership dues. CMWA membership is open to all women associated with the university. Mary Suresh is the CMWA honorary president. Board members are President Christa Cardone, Vice President of Programs Colleen Libertz, Co-Vice President of Programs and Marketing Jessica Corry, Vice President of Membership Lisa Georgi, Treasurer Rita Ciccariello and Past President Alexa Hansen. Learn more about the CMWA and the CMWA scholarship recipients.